I never bought into the notion that the city I spent my adolescence in was a perfect place. The whole image of London “The Forest City” Ontario was just too polished, clean and tidy one for me. 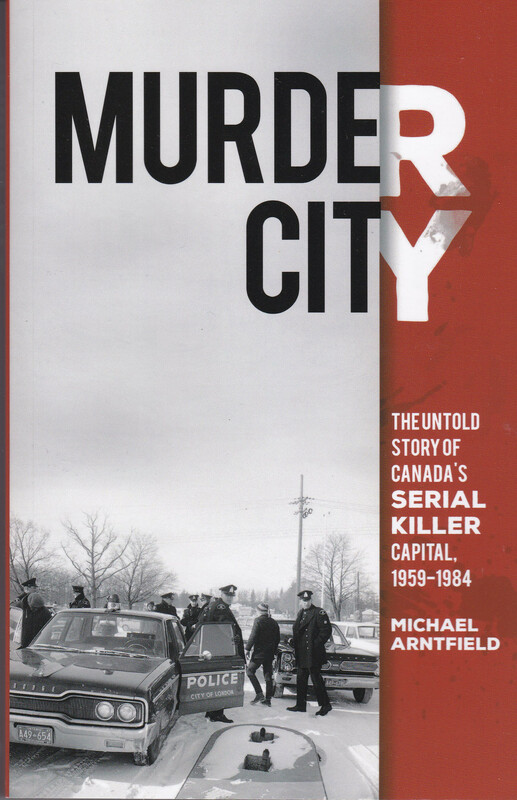 And that notion was confirmed for me and blown apart for many Londoners when Michael Arntfield published Murder City: The Untold Story of Canada’s Serial Killer Capital, 1959-1984 recently. This is a book about a city under siege. More that that, it’s a snapshot of specific time and place that may would like to forget and others never knew existed. It’s a book that serves as an exposition on what should have been the best kept secret in Canada, but which is now almost without question the worst. What is detailed in the pages that lay ahead has never been told before. For the better part of a quarter century, an unassuming city that was considered to be the epitome of Mainstreet Canada managed to secure one of the most dubious distinction of our era – being the serial killer capital of the nation and, more likely, beyond. Arntfield has used a great mixture of narrative and scientific fact to tell this story. He was given access to the detailed files of Dennis Alsop, a career police detective in the London area who passed away in 2011. In there was a collection of files of murder cases going back decades in which Arntfield – a former police officer himself and criminologist at Western University in London, ON – sifted through and used to bring forth this book. And in it is a story of heartache, loss and apathy that was needed to be explored. Secreted away in the basement of his London home during his final years, Dennis engineered the criminological equivalent of the Paris Opera Vault – arguably one of the most famous time capsules ever made. But while the Parisian version housed rare recordings to be opened up by future generations, Dennis Alsop’s capsule housed rare and forgotten files containing the answers to murder mysteries and unspeakable crimes that had long since gone cold. As a veritable Pandora’s Box, which, once opened, would pick the scabs off the city’s bloody past, it contained a ledger of names that had long since become a listing of ghosts, and which he would soon take to his grave with him. London’s book of the dead listed both the victims and their killers, whether known or suspected, many of whom found a way to escape justice and get away with it, some of whom were never so much identified, and some of whom are still alive today – roaming free. It infuriated Dennis in life, but in death he would find some solace by finally passing on the torch. Arntfield has done detailed job in both the research and the writing of this book. It isn’t a light read, nor should a reader rush through it. Both the emotions and the concepts explored in this book are complex and hard-hitting yet they are a part of the human condition that exist in the world. Beyond the distinction between psychosis and psychopathy, it should be noted that a psychopath is alos different from what is known as a sociopath, though the difference is more subtle. Prior to the 1980s, when Dr. (Robert) Hare helped clean up the nomenclature, the terms psychopath and sociopath were routinely and wrongfully used as synonyms. Even today, the distinction is lost on many people who should know better, including those in law enforcement. There are countless studies and even full university courses on distinguishing the two, but for the purposes of this book the easiest way to differentiate a psychopath from a sociopath is to think of a sociopath as someone who often possesses psychopathic traits and who exhibits evidence of what’s known as anti-social personality disorder, but who does not necessarily meet the threshold of clinical psychopathy. In other words, they might be malicious and even sexually or interpersonally treacherous, but they may not necessarily obtain a sufficiently high score on the (Psychopathy Checklist-Revised) to merit classification as a psychopath. Phrased differently, one might say that a sociopath is a type of psychopath-lite; or, that while a sociopath has major behavioral problems, sexual perversions, and impulse control issues, they lack the psychopath’s grandiosity or simply do not know any better. The psychopath, on the other had, often know better and simply does not care – they know and like what they are. The book is not all impersonal data and definitions. Arntfield explores emotions and thoughts in detail as well as he looks at the situations surrounding the cases that Alsop investigated all those years. Just as Georgia Jackson had done on a equally blustery winter night three years earlier, Jacqueline Dunleavy hung the “closed” sign on the front door of her part-time workplace just after the last customer was rung through at 6:15 p.m. By 6:30 p.m., she had her coat on and headed out into an unlit, snow-dusted street. She walked as she had countless times before to a city bus stop, just located two blocks to the south. Witnesses would later confirm that she had been seen standing at the Beaconsfield stop in anticipation of catching the last bus back to her family’s home on Griffith Street, near the London Ski Club. What exactly happened next remains unclear, but at least one passer-by would later describe seeing Jacqueline getting into a white four-door sedan, described as likely being a Chrysler. The witness recognized Jacqueline, but didn’t get a look at the driver. Jacqueline still hadn’t been reported officially missing when, at around 8:00 p.m., three teenaged boys fishtailed a mufflerless winter beater into the parking lot of the Oakridge Plaza on Oxford Street West, about five miles from the bus stop where Jacqueline had been standing in the cold. The panicked trio pulled in and flagged down Constable David Clark, a London Uniformed Division officer and colleague of Constable John Dunleavy – Jacqueline’s father – to alert him to what they saw while parking their car to go tobogganing at the nearby London Hunt and Country Club. Somewhat skeptical, Clark nonetheless called it in to dispatch and followed the boys back to the parking lot of then known, perhaps a sign of the times, as the Katherine Harley School for Retrainable Retarded Children – today, an upscale private school. When he arrived at the location and stepped out of his patrol car, Clark wasn’t entirely sure what he was looking at but equally knew it would forever change him. At the same time, just a few miles away to the southeast, Dennis Alsop was getting out of his own car and walking into his house on Beachwood Avenue after pulling a seventeen-hour day the London OPP detachment. He walked in the door and sat down to dinner, completely unaware that his predictions from two years prior were about to prove true. The other shoe just dropped. Murder City: The Untold Story of Canada’s Serial Killer Capital, 1959-1984 by Michael Arntfield shows a complex and ugly side to the supposed veneer that is London, Ontario, Canada. Arntfield has researched and detailed a difficult topic, giving it exposure for further consideration and discussion, like a good book should.